Advisory Neighborhood Commissions (ANCs) from across the District are rising in opposition to Exelon’s proposed purchase of Pepco, calling on Mayor Muriel Bowser to halt the deal. A majority of the city's 42 ANCs have now passed resolutions against the merger or publicly expressed concerns since public hearings began in mid-December. None of the District’s ANCs have expressed support for the proposed merger. 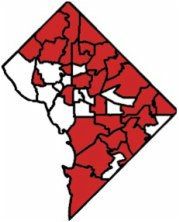 The District of Columbia’s ANCs are part of the DC government and consider a wide range of policies and programs affecting their neighborhoods. ANCs are the body of government with the closest official ties to the people in a neighborhood. A list of ANCs that have taken action is below. (c) Power DC 2015 Made in Washington, D.C.